In Sinsa-dong's Garosu-gil area, even regular pedestrians look like chic, fashion gurus. Garosu-gil is known as one of Korea's best shopping locations and it lives up to that reputation. Starting from a few years back, the 700m street that stretched from the Sinsa branch of IBK bank until the Sinsadong Community Center started to become saturated with businesses and one by one, cafes and shops opened up in the side streets as well. Let's take a walk through the streets whose popularity is backed by tourists and young people and where Seoul's fashion kings reign. Esmod Seoul, a French fashion school, made its way into the neighborhood in 1989 and the Seoul Mode Fashion Institute quickly followed suit in 1991. With these two organizations entering the area, it naturally became a hot spot for aspiring designers. In 1982, the Yeh Gallery relocated to the area becoming one of Gangnam's first commercial art gallerys and this is one of the main reasons why Garosu-gil came to be known as the "artists' alley". Garosu-gil also has plenty of boutiques, pop-up stores and markets that add to the overall atmosphere. 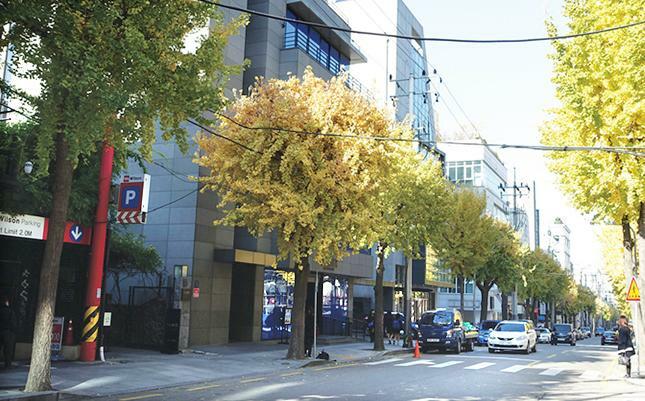 Garosu-gil is the number 1 spot for fashion, but in its back alleys is another thriving street that is ushering in the golden age of business: Serosu-gil. Serosu-gil can be accessed from exit 8 of Sinsa Station (subway line 3) and by following the tree-lined streets that border Dosan park on each side. The name "Serosugil" has two different origins. One meaning is said to derive from the original Chinese character "細", which means thin or narrow (i.e., in this context it would mean thin or narrow streets). The other meaning of "Sero" is vertical, which is the opposite of "Garo" (horizontal). There is a popular saying that highlights this "opposite" relationship: "Garosu-gil for shopping, Serosu-gil for eating." Starting from 2013, many designers and artists left the Garosu-gil area because of the expensive rent. After gathering to Serosu-gil, it has now become a commercial area. Small-scale art shops and workshops that were once part of Garosu-gil have now been passed over to Serosu-gil. It's almost like a hiding place for young people and through word of mouth and social media, this place has become a go-to spot for good eats. The Spain Club is one of Garosu-gil's most popular restaurants. It's well-known for its great Spanish cuisine. Look at the Ground for Information! Gangnam-gu is the first district in Korea to have QR codes embedded in sidewalks in major tourist areas. Visitors can scan the code to obtain information on nearby attractions. Because of Psy, the number of tourists looking for Gangnam has suddenly increased and QR codes are now even on marble pavements in Garosu-gil and Coex. If you scan the QR code, it takes you to English, Japanese, or Chinese versions of the mobile page and you are able to see information on locations, shopping, restaurants, cafes, and nearby attractions. Informative maps are offered throughout Garosu-gil for free. Subway : Line 3, exit 5 of Apgujeong Station, exit 8 of Sinsa Station. Another tip to enjoy Gangnam to the fullest! The Beatles wrote about Abbey road, Audrey Hepburn had her time on the Spanish steps, and another place where you can experience the story of today's stars is the K Star Road. See the shops that Hallyu stars love to go to and the entertainment agencies that they are affiliated with. Just like the Rodeo Drive in Beverley Hills, the young people of the 90's also nicknamed Apgujeong's fashion street as "Rodeo Drive." Filled with designer clothing and other merchandise, this place has become well known as a testing ground for foreign brands to see whether they would succeed in Korea's market.